In team play, the standard practice is for the team’s pointer to throw first and for the team’s shooter to throw last. Teams like to hold back their shooters — to keep them in reserve, so they will be available in case of an emergency. This strategy works well, but it can be frustrating for pointers. A few years ago we were playing a visiting team that had an exceptionally strong shooter. This gentleman, whose name was Van, had been a championship-level shooter as a young man in Vietnam. I was pointing well. But no matter how well I pointed, Van would play next and shoot away my beautifully pointed boule. Finally, I expressed my frustration to a friend. 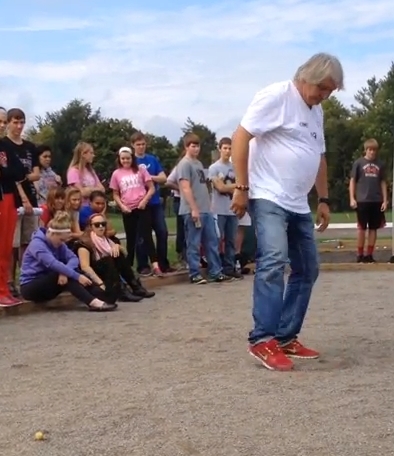 Here is a great post from the Harrogate Montpellier Petanque Club. I’ve lightly edited it for American readers. Always try to put your first boule in front of the jack. About 30-50 cm is a good distance, but even a meter in front is better than 10cm behind (see Backstops below). The French have a saying, “Une boule devant, c’est une boule d’argent” – A boule in front, that’s a money boule. 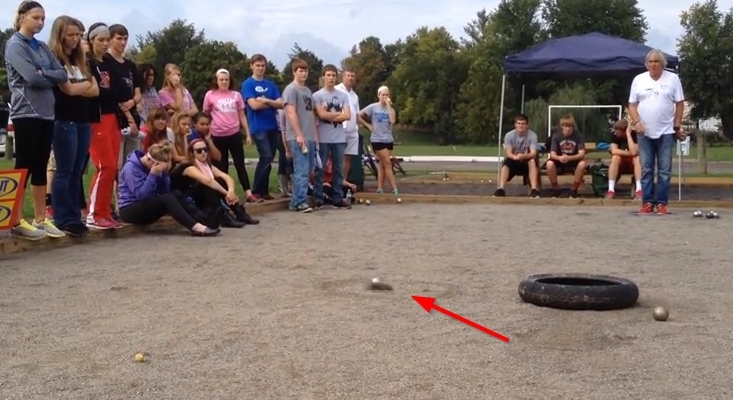 your opponent cannot roll their boule directly to the jack but must aim to the side of your boule. If their aim is a little off (or they get a deflection from an uneven terrain) and they hit your boule, the chances are that they’ll push your boule closer to the jack. 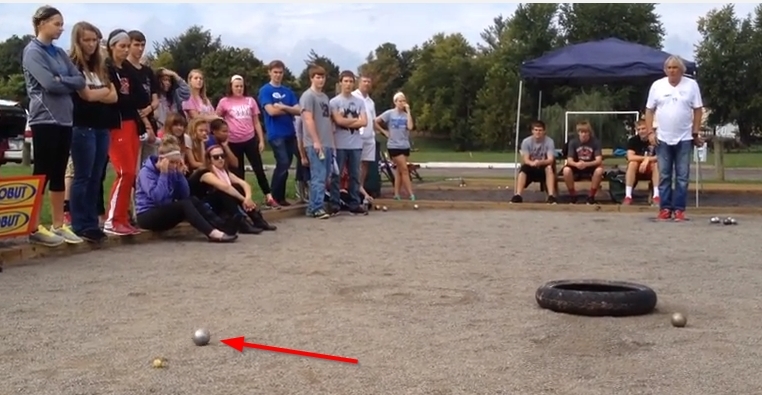 A boule just behind the jack is a gift to the pointer. It’s much easier to stop a boule against a backstop than it is to stop it without. Just throw slightly harder than you think you need to and let the backstop do its job. A boule resting against a backstop is also harder to knock away. If it is shot, it will be knocked backward; it will hit the backstop boule; all of the momentum will be transferred to the backstop boule (which will go flying!) and the boule that was struck will stay nearly in its original place. Of course, there’s nothing to stop the opposition from now using your boule as a backstop — but that’s all part of the game. As mentioned above, boules in front of the jack can be promoted by running your boule into them and knocking them forward. [Americans usually call this “pushing” your own boule.] 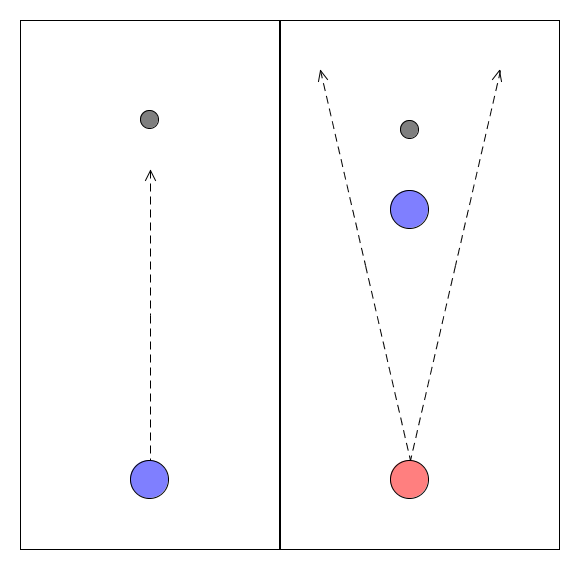 There’s often an additional benefit in that the second ball remains close to the point of impact, forming a blocker. Be careful if there’s an opposition boule close to the one you wish to promote. You can push an opponent’s boule as easily as one of your own, so take into account how accurately you can throw. 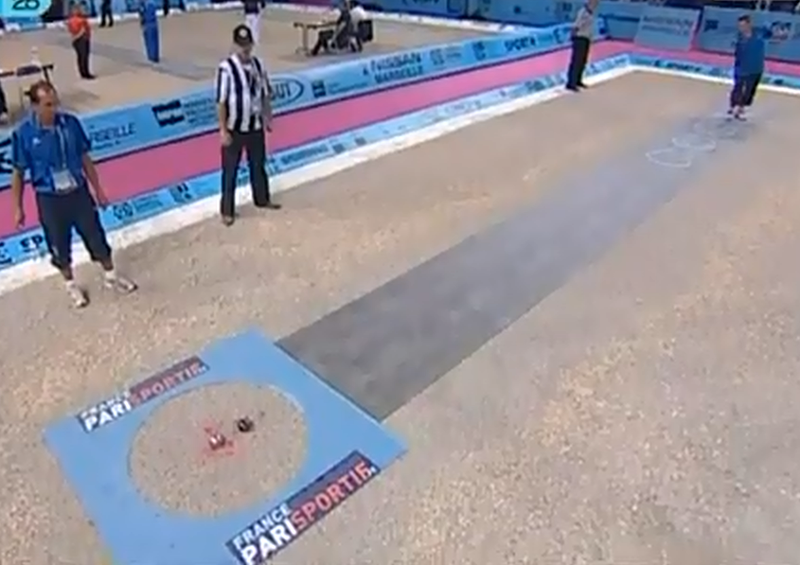 A common scenario for beginners starts when the opposition get a boule very close to the jack early in the end. You can’t really point closer so you try to shoot it away. Your team’s throws keep getting closer and you’re sure the next one will do it but you suddenly realize that your team have used up all of your boules! Your missed shots have probably all gone sailing off well past the jack, allowing the opposition to rack up a big score with their remaining boules. To reduce the odds of getting thrashed like this, you need to point one or two boules that, although not closest to the jack, are close enough to make it difficult for the opposition to score lots of points. Better for them to score a couple of points than five or six. Ideally, try to make your boule snuggle up to the opposition’s closest boule so that they’ll think twice about trying to shoot yours away. Shoot the jack out of bounds, but only if they have thrown all of their boules. This is a skillful shot but it stops the opposition scoring. Point slightly hard towards the jack and try to knock it towards some of your boules. Point and hope to beat the opposition boule. Shoot the opposition boule and hope that that will leave you closest. None of these strategies are an easy option but you don’t have a lot of choice. Here is one useful tip for effective pointing. When you point, there are three spots that are important. The first is the spot where the jack is sitting. The second is the spot where you want your boule to come to rest. Following the old maxim of “boule devant, boule d’argent”, this spot is in front of the jack. There is no standard petanque term for this spot, so I call it the “parking spot”. The third is the spot where you want your boule to hit the ground — the landing spot, the donnée. This spot is in front of the parking spot, so the boule can hit the ground and then roll into the parking spot. Second, decide where — in front of that — you want your parking spot to be. Third, decide where — in front of that — you want your donnée to be. And then aim for the donnée. This is one of the first things that any experience pointer will teach a new player. Here, for instance, is Marco Foyot. After picking the parking spot, pick the landing spot. … and let it roll to the parking spot. You can watch Marco giving the pointing lesson on YouTube. Here is an interesting video of what happens when you pit a team of expert pointers against a team of expert shooters. I first saw this clip a few weeks ago, and haven’t been able to get it out of my mind. I found it very thought-provoking and just a little bit shocking. It is 8 minutes long, but it is important to watch every second to understand exactly what you are seeing. And I keep wondering what the Thai team should have done. Thailand never changed its strategy. Every time Madagascar shot the Thai boule, and every time Thailand chose to point again. The Thai team is an excellent team. They can shoot too. Surely, I think, there must have been something that the Thais could have done to turn the tables on Madagascar’s shooters. But I don’t know what it could have been. The World’s Championship precision shooting competition is a relatively new FIPJP competition. The competition was initiated for men in 2000, and for women in 2002. Now the FIPJP organizes a precision-shooting competition in parallel with its other competitions— the men’s world championships in even-number years, and the juniors’ and women’s world championships in odd-number years. The FIPJP precision shooting (tir de precision) competition is a combined event (like a decathlon) with five different individual events (ateliers). 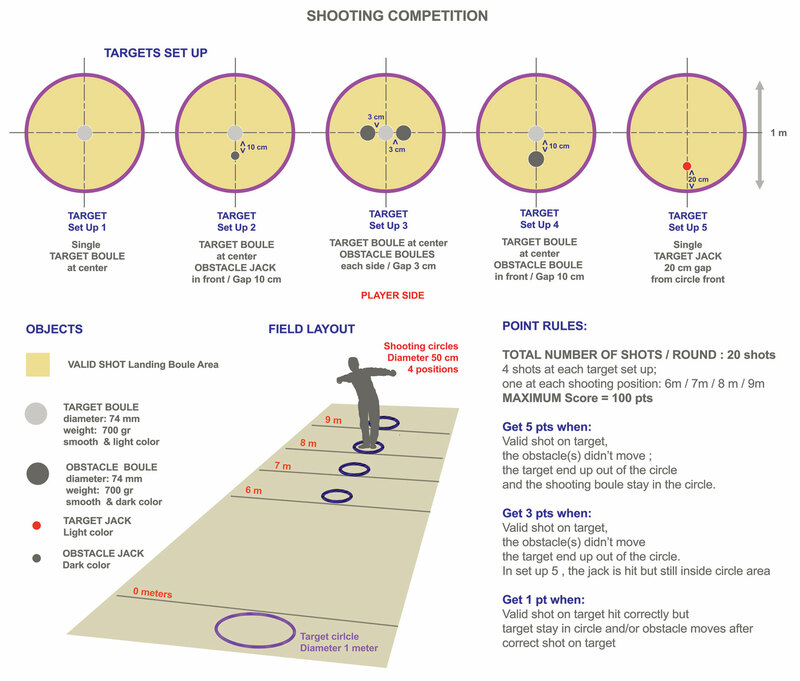 In each atelier the competitor throws four boules (one from each of four distances— 6, 7, 8, and 9 meters) at a target positioned in a 1-meter target circle (cible). 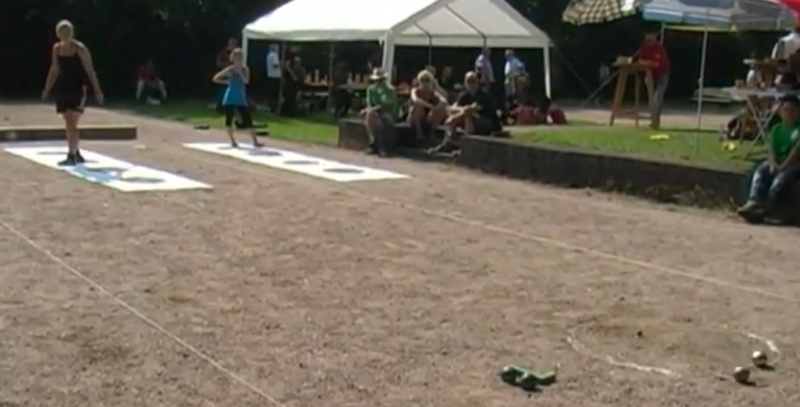 Since there are 5 events, and each competitor throws 4 boules in each event, each competitor throws 20 boules in total. 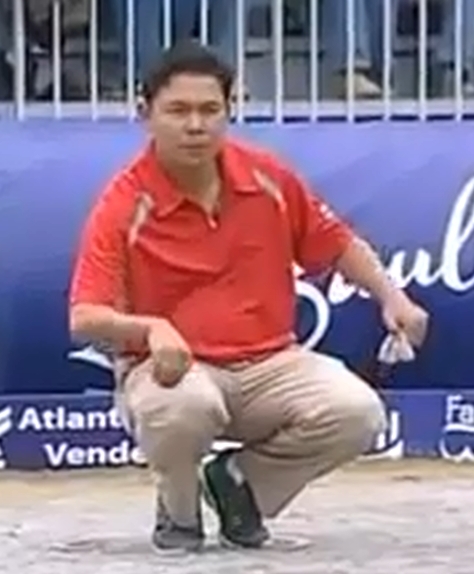 It is possible to score 5 points with each boule, so the highest possible score that a competitor can achieve is 100. 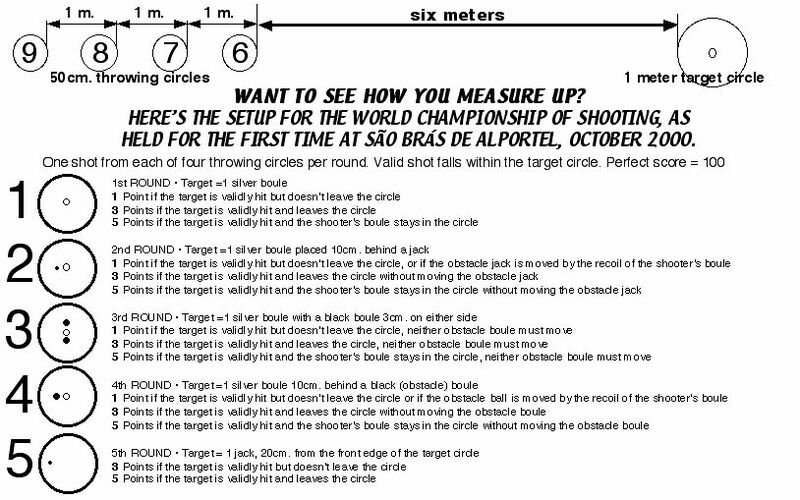 Here is a scoring sheet for recording the scores of a single competitor. In 2010 Claudy Weibel broke the record for highest score with a score of 66. Christophe Sévilla broke that record the next year with a score of 67. The basic rules. Click HERE to see the full-sized image. Excellent infographic courtesy of JakartaPetanque.com. Bruno Le Boursicaud at the 2012 World championships. A youth competition in 2011. At Mâcon in 2011 the contestants get the red carpet treatment. An official uses a frame to position the target boules and jack in the desired configuration.